Here are some Corinthian columns, pictured here in Brisbane. Impressive, aren't they? 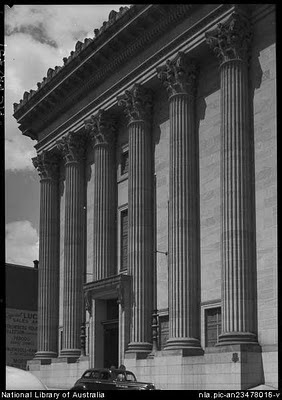 They are the work of architect and freemason Mr LL Powell, and they adorn the front of the Brisbane Masonic Temple, which is situated at 311 Ann St, right in the heart of the CBD. The building was constructed between 1928-30, and opened in December 1930 by the governor of Queensland. The photo was taken in 1950. Like most of the English-speaking world (and also many who don't speak English! ), I have read Dan Brown's The Da Vinci Code. I enjoyed it. But it is a work of fiction. The furore that surrounded it left me quite unmoved, save for the cynic in me that noted that all the fuss couldn't be harming sales of the book. I'm not a freemason, I've never thought about becoming one (being an atheist probably would exclude me anyway), and I only know a couple of people who have divulged to me that they are or have been Masons. Yet I shudder at all the conspiracy theories that plague them. The Masons build hospitals and nursing homes, for goodness sake. I just saw on a news program that the Masons are going to be more open about their role in the world, and I think that is a good thing. Similarly, I have never been a Catholic, and I deplore some of the past practices of most religions including the Catholic church. The Catholic church, it must be acknowledged, has also done a tremendous amount of wonderful humanitarian work. I don't subscribe to the secret societies and other extraordinary practices that are present in Brown's book. None of that stopped me from enjoying the riddles and twists in the plot and the way the story unfolds. Of course it's not one of the great novels of this millennium, let alone those previous, but enjoy it I did. Lange Powell's design for the Masonic Memorial Temple has withstood the tests of time and Brisbane's burgeoning population. Ann St is now one of the city's busiest, being the main thoroughfare from north to south through the city. My recent photo of the temple, now displaying the Masonic emblem suspended between the columns at the front, indicates the queues of vehicles that pass it each day. I haven't been inside, but I'd like to. The Masons' web site indicates that tours are available - and you can even learn a bit more about the Masons by looking through their web pages. I so agree...the masons do some amazing work and they do it quietly without fanfare and fuss. So what if they also like to get dressed up etc. One thing is for sure like the churches they also seem to know how to build to impress. I don't claim to understand their customs, but I applaud their community work.